This tiny and strangely-shaped stone is approximately 0.6m tall, and stands on a low round mound. 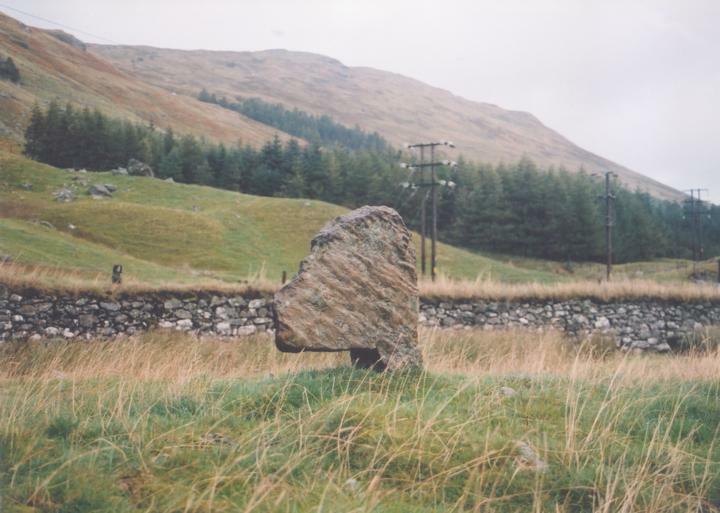 The shape of the stone makes it look a bit like a dog’s head, and legend has it this is the stone that Fingal used to tie Bran to, Glen Lyon being home to Fingallian stories. It is said that in the past, girls from the glen would crawl under the protruding part of the stone in a bid to stop themselves becoming pregnant. Cona Bhacain is in the parish of Fortingall and the county of Perthshire. Published on the 14th of May 2010 at 4:19 pm. Updated on the 31st of March 2011 at 6:37 am.